In SPSS, RV is short for random variable. It draws random values from a given probability distribution.Strictly, probability density functions should be distinguished from probability distribution functions but we'll refer to both as “probability distributions”. The latter is specified as a period separated suffix as in RV.BERNOULLI(.5).RV is mostly but not necessarily used with COMPUTE. A nice way to get familiar with some common probability distributions is to visualize them. The syntax below does this by computing random variables from different distributions and creating their histograms with FREQUENCIES. After running it, we'll briefly walk through the distributions we visualized. loop id = 1 to 1e4. /* 1e4 is short for 1 * 10**4 (= 10,000). RV.NORMAL(mean,SD) is used for drawing values from a Gaussian ("normal") distribution. 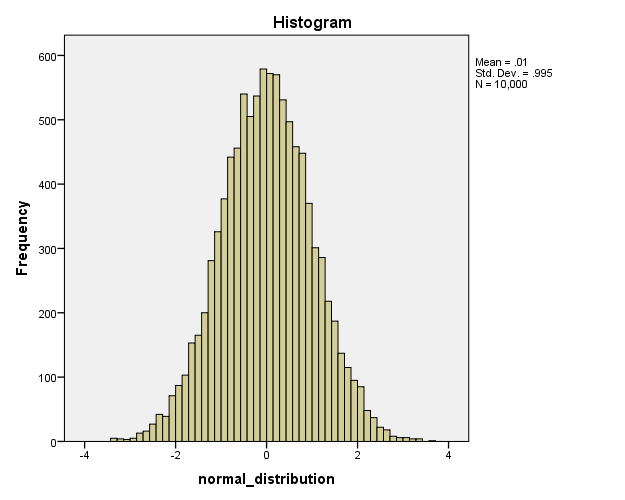 RV.NORMAL(0,1) returns random values from the standard normal distribution. RV.UNIFORM(mininum,maximum) draws values from a (continuous) uniform distribution. This means that all values have the same chance of occurring. An example are throws with a balanced die: values 1 through 6 all have the same chance of (1/6) of occurring. This can be simulated by TRUNC(RV.UNIFORM(1,7)). The fractional values are discretized here by truncating them. RV.BERNOULLI(probability) results in only zeroes and ones where the probability denotes the probability of drawing a one. For simulating flips with a balanced coin, use RV.BERNOULLI(.5). RV.BINOM(attempts,probability) returns the (discrete) number of “successes” given the probability of succes and the number of attempts. An example is the number of heads that come up when 5 coins are flipped. The result can be anything from 0 through 5. Therefore, RV.BINOM(5,.5) returns numbers from 0 through 5 as if they resulted from this experiment.Note that RV.BINOM(1,probability) is equivalent to RV.BERNOULLI(probability). We usually say that “the Bernoulli distribution is a special case of the binomial distribution”. For more probability distribution functions, consult the command syntax reference under “Universals”. Related to the RV function is the CDF (Cumulative Distribution Function). This returns the cumulative probability given a test statistic value and probability distribution. Also related to the RV and CDF functions is IDF (Inverse Distribution Function). It returns the test statistic value, given a cumulative probability and probability distribution. You could write NORMAL(1) instead of RV.NORMAL(0,1) and UNIFORM(1) for RV.UNIFORM(0,1). This notation was used in SPSS versions 5 and below and still works for backward compatibility. We find it not very readable or intuitive and therefore rather avoid it. Thanks for the compliment! Hope you'll like some of the other tutorials too.